We are less than 30 days away from the opening of the Universal Exhibition in Milan, an incredible opportunity for Italy, for world tourism, to learn about the global challenges of food security and healthy nutrition through worldwide best practices. An essential highlight will be represented by the fundamental role of women in agriculture and the issue of empowerment and gender equality in agricultural production- especially in developing countries - the importance of rural development and of waste reduction, to reach environmental sustainability and for a better use of planetary resources aimed at ensuring food for all. Statistics from the United Nations World Food Programme- WFP- estimate that 805 million people suffer from hunger, including 1/9 children who go to bed at night hungry. 160 million children are malnourished and do not have the opportunity to develop the same cognitive skills as their peers, who had the opportunity of essential nutrition in the first 1,000 days of life instead. The world is growing. In 2050 we will be about 9 billion. The demand for food will continue to grow. The numbers estimate that there is now enough food to feed everyone, but there are huge economic imbalances between hunger and malnutrition on one hand, and the cases of overweight and obesity on the other, which are rising to about 1.4 billion on a worldwide basis. With the launch in 2012 of the Zero Hunger Challenge - a challenge to put hunger down to zero, as tangible product of the United Nations Conference on Sustainable Development Rio + 20 - the United Nations has a vision for a world free of hunger, where we can face the growing demand for food and new environmental challenges that go hand in hand. The question of the United Nations is the following one: Is it possible to ensure that all people at all times have access to sufficient, safe, nutritious and sustainable food? Food that allows everyone to lead a healthy and productive life without compromising the needs of future generations? The United Nations at Milan Expo 2015 wants to prove that this is possible. Now and with the commitment of all of us as part of the solution, guiding us and showing us how to do it. The UN itinerary in Milan includes 5 pillars: 1) Zero stunted children less than 2 years 2) 100% access to adequate food all year round, 3) All food systems are sustainable 4) 100% increase in smallholder productivity and income 5) Zero loss or waste of food. Complementing these five pillars, the issue of women empowerment and gender equality is an essential part of the discourse. Women as economic and social engine of society, with equal opportunities to work the lands, to build and create income to ensure adequate educational training for their children. At Expo 2015, the United Nations drew a route starting from Pavilion Zero, in the main entrance of Milan Expo, where visitors will be introduced to its central theme. The itinerary will transversally cross all Expo via 18 blue spoons that will mark the UN presence in the different Expo sites. The Clusters are 9, bringing together 75 Countries and two International Organizations: Rice, Cocoa, Coffee, Spices, Aride zones, Fruit and Legumes, Island Sea and Food, Bio-mediterraneum, Cereals and Tubers. A key point of the path will be the UN Garden located at the beginning of the Decumano, the main street crossing the whole site from east to west covering a distance of 1.5 kilometres. This green area will present the UN operations, especially the ones in response to emergencies and UN's development projects. The Biodiversity Park will display a variety of plants, which together represent agricultural and natural biodiversity in Italy, exploring the different agricultural techniques and methods, including organic practices to show how food systems can be sustainable by using, for instance, climate-resilient agriculture practices (of energy, land use, water and climate) and ensuring the responsible governance of land, fish and forests. The Future Food District will introduce smarter and innovative ways to cook, understanding the food supply chain, from production, to preparation, distribution and consumption. The Children's Park will be a space where children can explore Expo's theme in a fun and educational way. Through videos, photos, maps and infographics, the UN installations will seek to demonstrate how access to food and natural resources is necessary and important to ensure a sustainable development for the future of our planet. The blue spoon will therefore create an educational and interactive itinerary, clearly showing the message of how it is possible to end hunger in our lifetime. With awareness of what we consume, and our daily contribution. In addition, the United Nations will celebrate three UN Expo Days, during which the sites of Expo will be transformed in the colors and branding of the United Nations. It will be a surprise. The days will be June 5, World Environment Day; August 19, the World Humanitarian Day; and October 16, World Food Day. 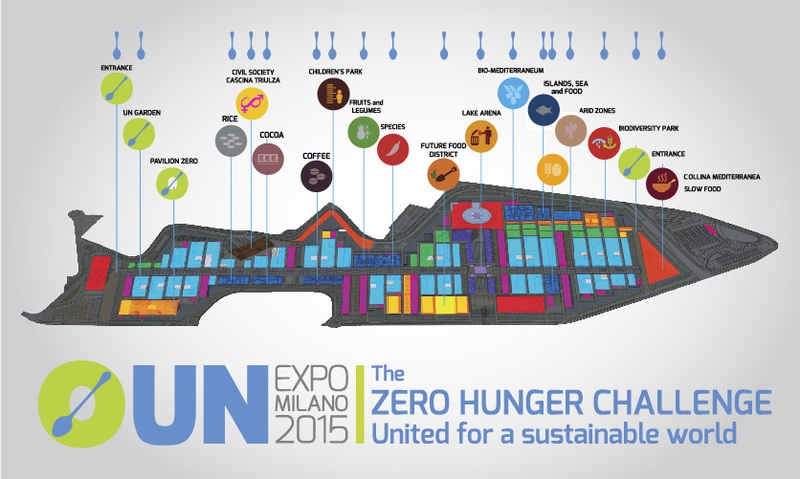 Below the map of the United Nations at Expo, print it and take it in your backpack for a visit to Expo! The UN Secretary General Ban Ki-moon stated: "In a world of plenty, no one, not a single person, should go hungry. Ending hunger is everyone's responsibility. All of us have a role to play, even the commitment to change through simple day-to-day actions or decisions " And it is all about our commitment for a better and more sustainable world.